A great way to fill your day with some more gaming is via gaming magazines. And Yaah! Magazine is making sure you get their latest issue as soon as it's available. Be the first kid on the block with it when you pre-order now. They've even got special pricing for those that put their name on the list. Flying Pig Game announces the latest issue of their critially acclaimed quarterly tome of gaming goodness, Yaah! magazine. It's Yaah #10 and this issue's game looks like a great place to start. 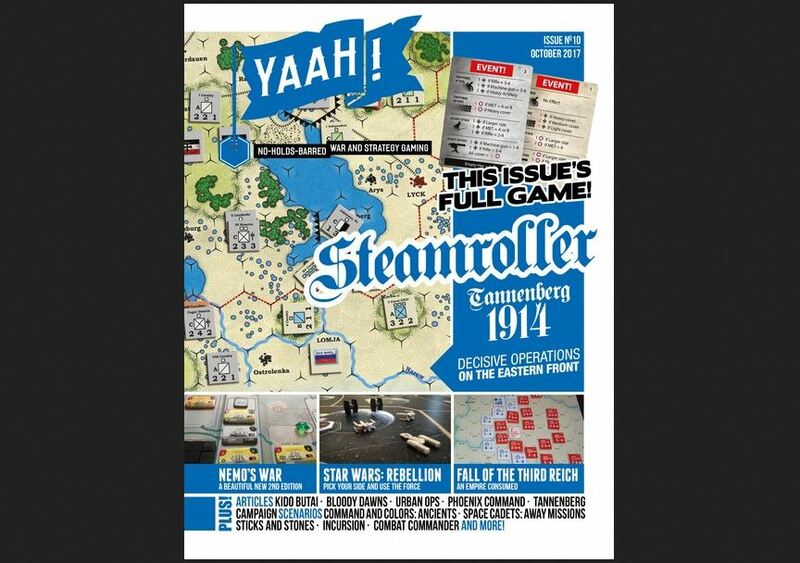 Hermann Luttmann's Steamroller is a highly playable (and when we say 'highly playable" we mean "fun as hell"), tense, operational look at 1914's pivotal Tannenberg campaign. If you "read it for the articles", we've got you covered. Nick O'Neill visits a galaxy far, far away with his take on popular Star Wars: Rebellion, while Deborah Malmud dives deep into VPG's gorgeous new 2nd edition of Nemo's War. Roger Leroux gets up close with Urban Ops, newcomer Keith Beason scrutinizes The Fall of the Third Reich, and John Burtt takes a look at Bloody Dawns. It's not Yaah! without the scenarios, right? We've got the second part of Chuck Turnista's fascinating King Arthur scenarios for Command and Colors: Ancients, an exclusive setup for Space Cadets: Away Missions by Tom Russell, a Sticks and Stones scenario pulled from Mark H. Walker's Dark War: Retribution from the designer himself, to name but a few. It's 78 pages of gaming greatness, and it ships in October (of this year). That's a bunch of stuff, and it's only $34 if you catch the pre-order price now. The magazine will ship in October.